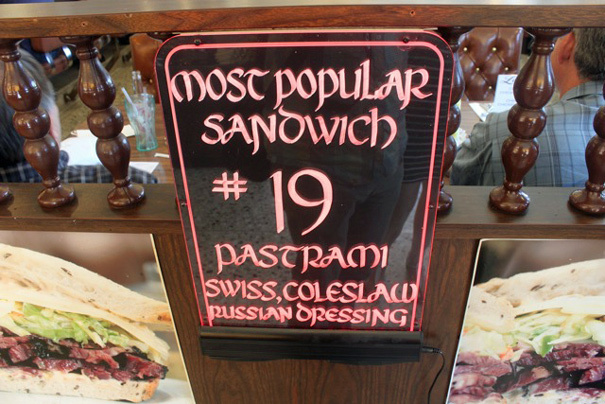 As a New Yorker who grew up on the east coast (both in New York and Florida, major pastrami territories) I found this hard to believe. When I shared this tidbit with others, they’d be offended. 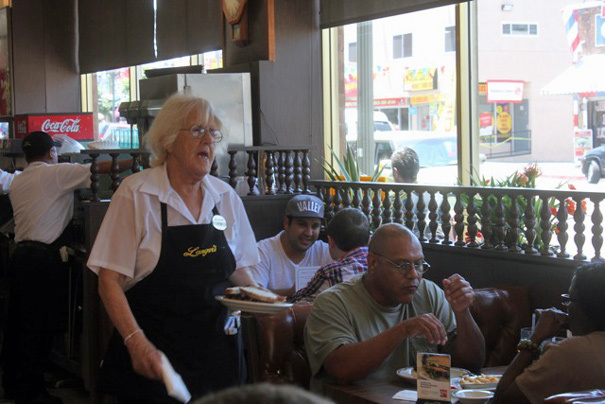 “The best pastrami’s in L.A.? No way,” would be a typical response. On Saturday I brought Craig, Mark and Diana to Langer’s to experience this blasphemy firsthand. 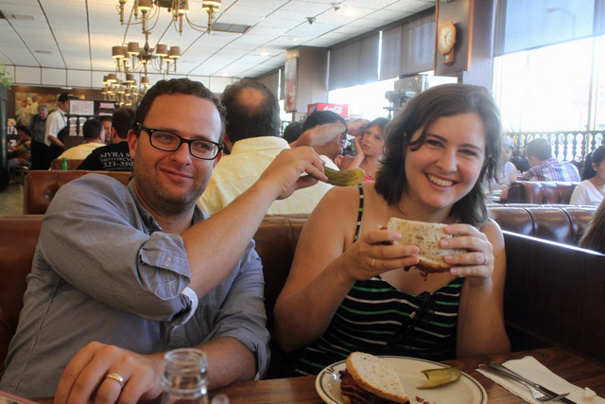 All three of us moved to L.A. from New York in the past year; would Langer’s really hold a candle to Katz’s? Was Nora Ephron just being provocative? Did we really want to eat pastrami on a hot summer’s day? 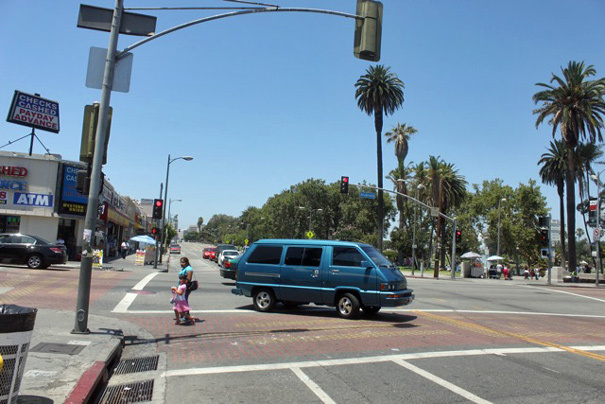 These were important questions and after a short drive on the 101 (exit: Alvarado) we were ready to answer them. First, a confession. 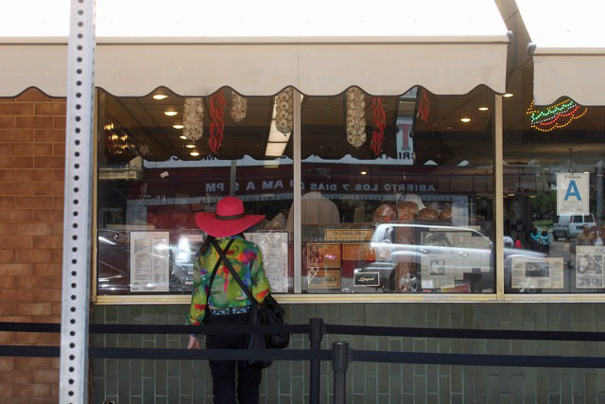 I’d been to Langer’s before (9 years ago) and absolutely loved it. It was the best pastrami I’d ever had, but for the sake of narrative energy, let’s pretend that never happened. 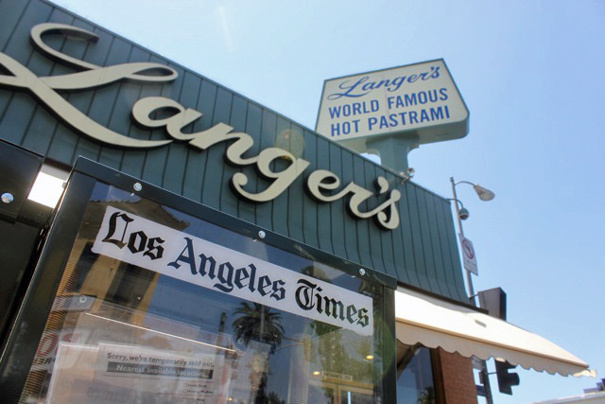 Langer’s is in a vibrant area of L.A., near MacArthur Park (which is rather seedy but makes for a melodramatic song), an anomaly on a street where the 2nd closest thing to a Jewish deli is a pawn shop with a deli-like neon sign. There’s a parking lot specifically for Langer’s, so that makes things easy. Outside is a roped-in area for people to line up, though we didn’t have to wait very long. 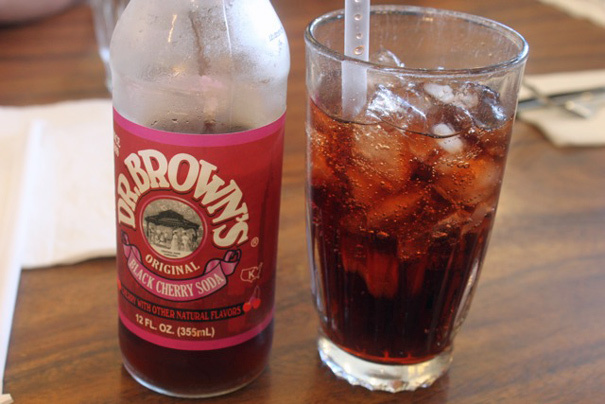 When we got to ours, I immediately ordered my traditional Dr. Brown’s black cherry soda (it’s my deli ritual). 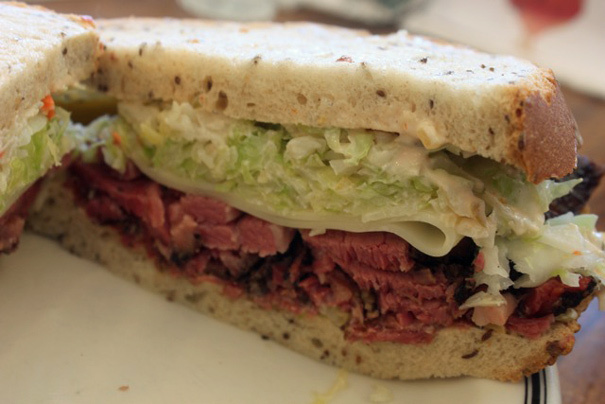 As Nora Ephron points out in her essay, two things make the Langer’s pastrami sandwich great. 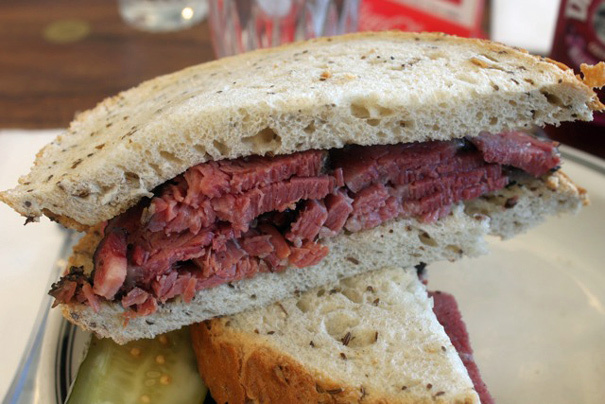 One: the pastrami is steamed extra long (three hours, as opposed to the traditional 45 minutes) so it shrinks and becomes extraordinarily tender (avoiding the “smoked rubber band” effect Ephron describes). The other thing is the bread: it’s started at a bakery and finished there at Langer’s so the bread is crusty and wonderfully fresh. The #19 obfuscates some of that, but not criminally so. If you want those things on your sandwich, by all means order it. That, there, is a masterpiece. Pastrami, bread, and mustard. Three components married beautifully, harmoniously, majestically. It’s not piled disgustingly high, it’s just the right balance of spoon-tender meat and bread. It’s wonderful. There was some debate as to whether the meat was truly better than Katz’s, but there was no argument that the bread was. The bread, ultimately, sealed the deal. 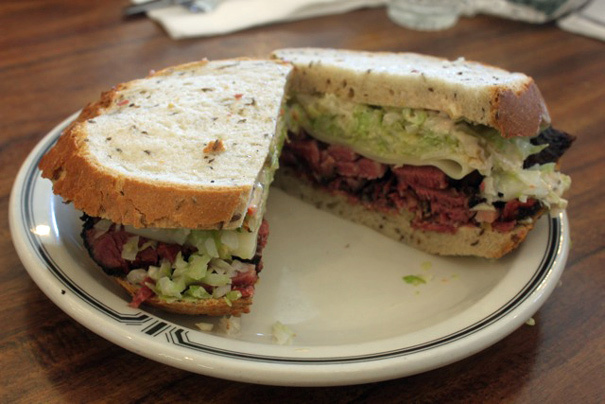 Legend has it that Nora Ephron would chaperone L.A. visitors to Langer’s and treat them to pastrami. She must’ve gotten real pleasure from watching people discover the wonder of this sandwich, a sandwich that really is the finest hot pastrami sandwich in the world.